Following two years of intense art making in the visual arts course, my students celebrated their achievements with a final art exhibition. They spent the week prior to the vernissage curating their own shows, and with family and the school community in attendance inaugurated the exhibition, enjoyed each other’s hard work, and toasted to their accomplishments. Little did I know that this would lead to a funny, sophisticated and thought-provoking end-of-term prank. Aside from the celebratory nature of the event, the exhibition is the internally assessed component of their IB Diploma Programme (DP) visual arts course. 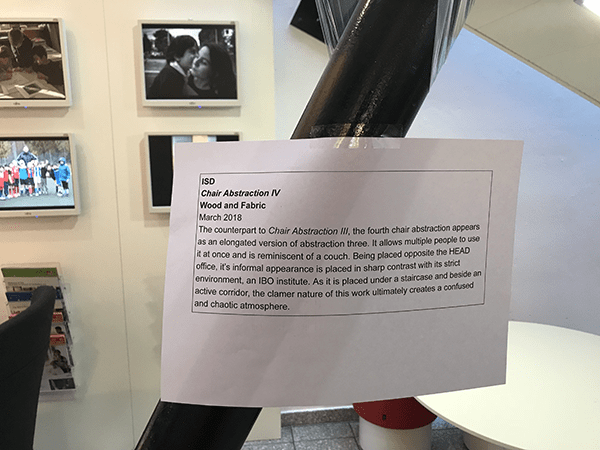 For this component, students are expected to realize a number of resolved artworks, and also act as curators for their own exhibition. 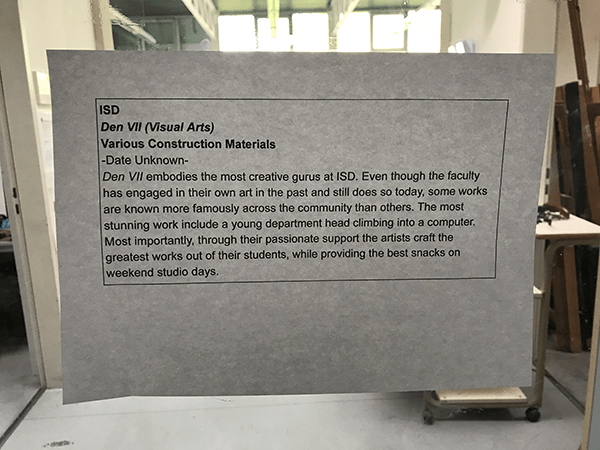 In formalizing the role of curator within the visual arts course, the IB places value on the importance of selection, arrangement, display and audience. Part of the students’ task for assessment is to write a curatorial rationale for the entire exhibition in which they explain the decisions that they made in displaying their work, and a short “exhibition text” to accompany each of the works in exhibition (similar to wall text that one finds beside an artwork in a museum), in order to explain, contextualize and note sources of inspiration. The texts are opportunities for students to recognize how the curatorial task of explanation can create connections and meaning in and between works in ways that go beyond visual similarities. It is also an important concept in contemporary art, where the curator has gained greater stature for creating meaning through exhibition making. The star Swiss curator Hans Ulrich Obrist once summed up the work of another curator by stating that “in the organization of exhibitions, the works must not stand in the way (Obrist).” Ultimately it is the vision of the curator that frames the way in which an audience moves through, looks at, and interprets the objects in the exhibition. Following the exhibition, students wound down their remaining classes before leaving on study week in preparation for exams. The last day of the last week of regular classes for twelfth-grade students is known at our school as Senior prank day. Much like in many schools around the world, this is an opportunity for some sanctioned mischief, during which twelfth-grade students let out steam by disrupting the daily working of the school. This year, arriving at school on the morning of senior prank day I was surprised by curious printed text hanging at various locations. On closer inspection, the printouts turned out to be exhibition text written by twelfth-grade visual art students. 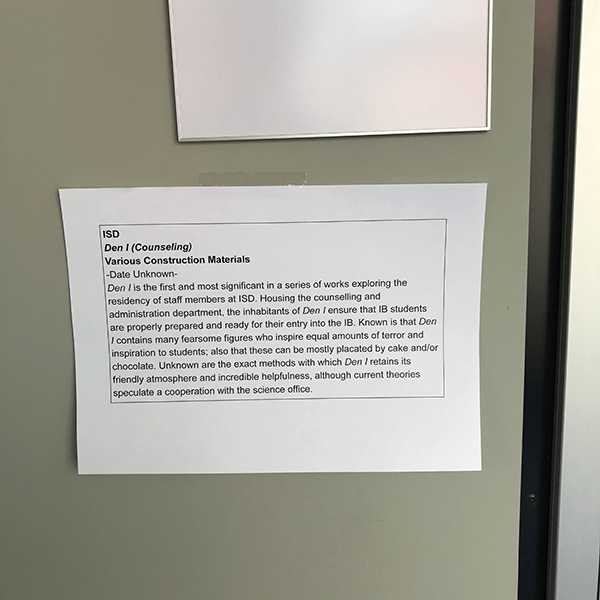 The texts (about fifty in total) were placed beside furniture, and at the entrances to classrooms or hallways, utilized the format of exhibition text to poke fun at, and critically question the customs and culture of the school. Students understood that by recasting the school itself as an exhibition, and the elements within the school as works of art, that they could reframe our understanding of and relationship to the context. 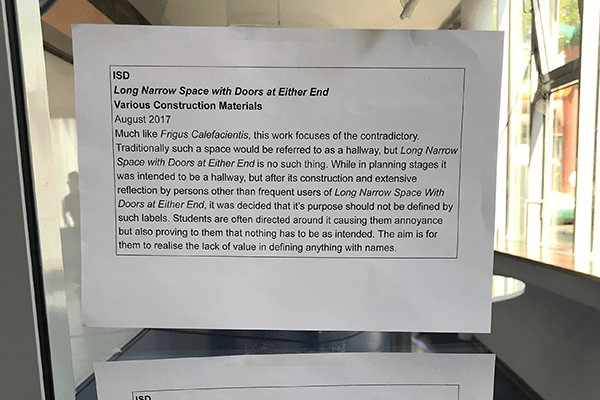 Some of the texts “Long Narrow Space with Doors at either End” took aim at initiatives within the school, like the transformation of what was once a hallway into a learning space. This text also made clear art historical references to Installation artworks like Bruce Nauman’s “Changing Light Corridor with Rooms”. 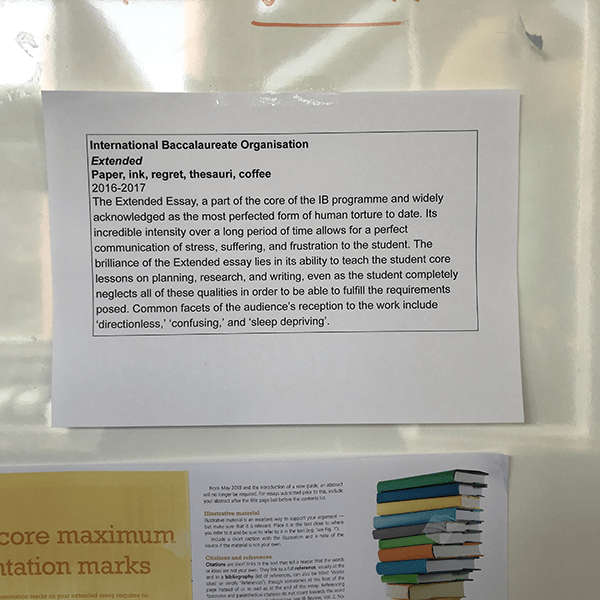 Other texts were expressions of relief at having completed the rigorous DP, such as “extended” where the extended essay was recast as extended torture for the toll it took on student’s time. Finally, some texts such Den I (Counseling), hanging at the entrance to offices or classrooms, paid homage to the faculty and staff. I was proud to see that students took away from the visual arts course a deep understanding of the impact and power of context and framing, and that they were able to apply it playfully, creatively and critically to the world around them. 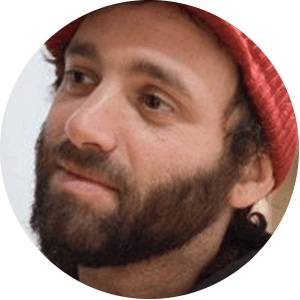 Nathaniel Katz is Head of Visual Arts at the International School of Düsseldorf, Germany, principal examiner for DP visual arts and is also a practicing artist.